The decision to find the right talent for a role in a company turns unfavorable at times, especially for startups that are often inexperienced at hiring as they themselves have just entered the land of the unknown where different avenues of problem-solving & decision-making are yet to be explored. That’s not the case only with startups and small companies. Even the Fortune 500 companies reported facing the same shortage of talented professionals for various positions. 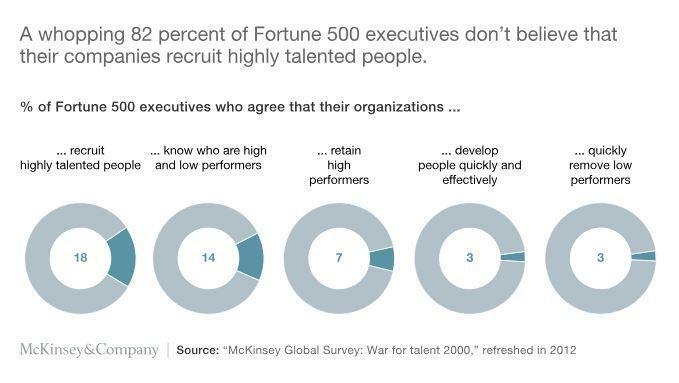 Check out McKinsey stats below. And, when the search is for a professional who is as well talented and creative – as required in the case of digital marketing – things can turn even more awry. Digital marketing roles are at a crossover pushing professionals to find unexplored methods and strategies to get a job done successfully. Frequently updating technologies and a parallelly-changing consumer behavior is making marketers scratch their heads for the right solution. Given the circumstances, companies need people who can work across multiple marketing disciplines to get the job done. However, it’s easier said than done when it’s about identifying such talent during interviews. By asking the right questions, you can place yourself in a better position to assess the abilities and skills of a candidate. Here are some digital marketing interview questions that you should not miss asking when interviewing a candidate for a role in your company. How creative can you be? Give an example. Digital marketing requires both – creative and analytical thinking ability, so look for a candidate who shows the excitement and capability for both. Many digital marketers want to focus purely on one or the other, which fails them at bringing both “art and science” to their digital program. While interviewing, ask your candidate to explain their creative and analytical process through sharing a previous experience. Also, give example cases relating to the position that the candidate is applying for and observe what path he/she takes to solve them. Can you easily adapt to new techniques and technology? If yes, identify the upcoming trends that will soon be integrated into digital marketing. Analyze the candidate’s ability to see and understand the big picture as they talk about the future trends in digital marketing. Encourage them to talk about videos, social media advertising, marketing automation tools, and about their role in the present time and in the future to understand their grasp of these matters. Also, check if the candidate has an idea of the codes and algorithms that cause those digital techniques and technologies to function the way they do. And, can they adapt to changes caused by frequent algorithmic updates? How comfortable are you with Analytics? Give us an actual example. No list of digital marketing interview questions is complete without including a few questions to analyze a candidate’s analytical ability & skills. As data analysis is an integral part of the entire process of creating and running a digital marketing campaign or program, you should select only those candidates who possess superior skills working with data. Examine their skill level in tools like Google Analytics. Check if they have any certification. If yes, is it of fundamental level, or intermediate, or advanced? Your digital marketing candidate needs to possess the competencies and the general knowledge required to provide actionable metrics and prove their value with real data. We hope that these questions will help you identify the core capabilities and skills of a candidate and find the best fit for a role in your company.